How Technology Has Improved The Gun Safes? #1 How Technology Has Improved The Gun Safes? Technology is awesome and it is constantly improving, but how exactly has technology improved the gun safe? The first gun safes were good and many people still love their old trusted box and mechanical safe, but technology has made strides in all areas of the world. In this article I like to share a better idea of how technology has improved gun safes and the usage of them. The steel used in various gun safes are put through much harsher test to ensure that the safes are durable and strong. Without technology, it will be hard to determine a fire rating for a safe and how long the safe will be able to withstand various heat sources. The stronger and durable steel will give you more peace of mind and make life exceedingly harder for intruders to break or pry open the safe and get to your valuables. When you think technology, speed does come to mind and it is definitely true when it comes to gun safes. The biometric fingerprint scanner, for instance, will allow you to open the safe in a matter of seconds and you will have total access to the safe to make sure that you never get caught off-guard again. The faster access is also great in terms of not having to sleep with the gun under your pillow and it has been proven that a loaded gun under a pillow is extremely dangerous and no one does ever recommend this. While this feature does not have much to do with the protection of the safe, it does really make the safe much easier on the eye in the household. It is always better to have your safes concealed, but with larger safes, this can be harder and the stylish look will allow you to decorate the safe and have it on display in the home. Yes, now a safe is not only just a safe, but it can also be small and portable enough to fit into your car and to be carried along throughout the day. Without technology, we would still be stuck with storing everything at home and this can be bad when you are traveling or in need of keeping valuable documents safe. With the advancement of technology, all of this is now possible and you could easily store your gun safe close by at all times. The old traditional keylock is good, but it is not the best and it can be weak at certain points and even be picked with the right tools. Technologically advanced locks are more durable and they have a total lockdown feature built in. This will force the safe to go into total lockdown and secure everything with all of its power. We recommend the biometric lock for this, but the electronic lock is also great, it will only require you to remember a passcode, where the biometric lock, only requires you to use your fingerprint, but both of these do have their pros and cons. Technology has allowed gun safe manufacturers to experiment with various new designs in order to make it possible to conceal your safe better. 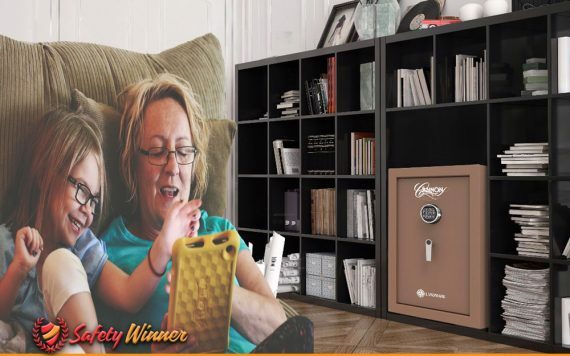 Now you will have the opportunity of hiding the safe in the wall, instead of mounting the safe against the wall and some of the larger trunk safes can even be concealed in the floor for better protection. Car gun safes no longer need to kept in the trunk and they can be mounted close to the driver seat to give you faster access. Holster safes make accessibility better and they use gravity to your advantage to give you much faster access and office safes can now be hidden underneath your desk as well. Many people still consider these features to be a waste of time, but in reality, they are great and they will make life so much easier for you. It will be great to have a portable safe that allows you to charge your mobile phone on the go and the added backlights and internal lights will make finding and open the safe much easier. The alarm systems can even alert you when someone is tampering or if you forget to close the safe and we have also seen a few safes that can be connected to a mobile app and you will have portable control over the safe. From the steel, all the way to the ability to charge your phone on some of the portable safe, gun safes have evolved and many people are missing out on some great features. Yes, keeping your guns safe and your valuables secure is still the number one priority, but many of these gun safes now, offer so much more to the buyers.